Can you use your swimming pool year-round or virtually year-round? Depending on where you live in the U.S. and some strategies you take, the answer is “yes”. These folks aren't necessarily kin to polar bears, nor are they only fortunate to have a home in a tropical or desert climate. Instead, these pool owners know some savvy ways to keep the water warm and sparkling clean during fall and even winter months. Use a swimming pool heater or heat pump. If your swimming pool doesn't already have a heating system, installing one can significantly extend your swim season by raising water temperature. Ultimately, how warm your water will depend on factors such as your pool size and its configuration, the temperature outside, and how long you run your heating system. Beside solar systems—which can be an excellent choice in some climates—there are two main kinds of heating systems that work regardless if the sun is shining: Traditional gas heaters and electric heat pumps. With a gas heater, water runs through a combustion chamber where it is warmed. 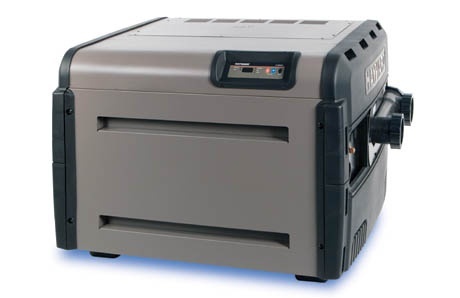 A key advantage of a gas heater is that it will increase your pool’s temperature more quickly than a heat pump. It is usually a better choice for a pool with a spa, as it gives you the option of heating the entire pool, or only the spa—which requires far less time and energy. Heat pumps run with electricity, but they don't directly produce heat; they extract warmth from the ambient air, and then use that to warm the water. It’s critical to note that according to the DOE, heat pumps lose effectiveness when the air temperature drops below about 55 to 45 degrees Fahrenheit. In addition, regions with low humidity, such as desert climates, heat pumps are not very efficient. This reality makes heat pump better suited to warmer climates where they can be used to keep pools relatively warm year round. They do cost more to purchase than traditional heaters, but they typically cost less to operate, making them popular in certain parts of the country. If you are serious about using your pool when it’s chilly outside, a traditional gas heater is usually your best option. You can minimize your utility bills by choosing the most energy-efficient model; you may pay a little more upfront, but doing so will save you in the long run if you frequently heat your pool. Use a swimming pool cover. When the mercury dips low, a pool owner with even the most energy-efficient heater or heat pump may be reluctant to run it too much due to fuel costs. However, a pool cover can help by preserving some of the heat generated by a pool heater. That means you won’t have to run your heater as long or so often—minimizing fuel consumption. While pools lose heat in a variety of ways, water evaporation is the biggest source of energy loss. That’s why the U.S. Department of Energy (DOE) promotes covers as a way to reduce pool-heating costs. 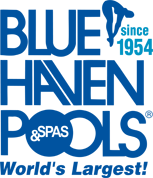 Specifically made to fit various pools shapes and available in wide array of colors and styles, vinyl covers are relatively affordable and very durable. To keep your pool as warm as possible, you can also spend a bit more on an insulated model that has been designed to trap heat inside the water. 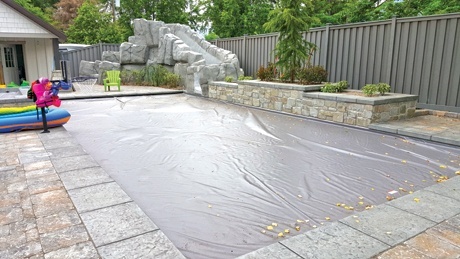 Safety covers are designed primarily to prevent accidental access by children or animals. They are secured to the deck with devices that fit into pop-up fittings that are mounted into the deck around the pool. This way, they cannot be removed by a young child. These covers also keep out debris, and versions that are solid—vs. mesh or net—will prevent some heat loss. However, they are not the optimal choice if you really want to maximize pool use year-round. Also called solar covers or solar blankets, a bubble pool cover resembles packing bubble-type packing. The bubbles provide a dead layer of air that helps with insulation in the same manner that double-pained windows do. Best of all, they provide an extremely affordable option, typically running under $150.00. Most covers can be installed to operate in manual, automatic, or semi-automatic fashion. A fully automatic system saves time and physical effort because the cover works at the touch of a button. Of course, convenience does come at higher price point, and automation usually requires professional installation. Looking at the manual option, the unpacking, packing, and installing a covers takes time, a bit of labor, and requires a storage area for when the cover is not in use. A good compromise on your wallet is a cover that comes on its own rolling reel. To remove the cover, you simply turn a crank to reel the cover in. To place the cover, you turn the crank as well, but also need to manually pull the end of the cover to help stretch it out fully across the pool. Regardless of the kind of cover, using one in conjunction with a heater goes a long way in economically maintaining a comfortable swimming environment. 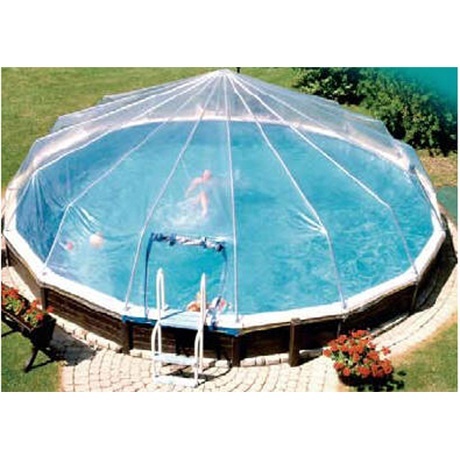 Use a swimming pool dome enclosure. Newer on the market are structures known as domes or dome enclosures. Pool domes help conserve energy while provide a warmer swimming environment. By acting as a passive solar heater and by keeping out some of the cold air, they boost the temperature in both in the water and the air around the pool. Most domes are supported by forced air from an air pump. The pump pushes heated air into the enclosure so that cold air from outside will not cancel the effects of the solar heat. Along with helping you enjoy a longer swimming season, dome enclosures provide another advantage: In addition to keeping out some of the chill, they also keep out debris like dirt and debris, as well as leaves and insects. The result is a cleaner pool that’s easier to maintain. Your swimming pool can continue to be part of your backyard experience for at least a few months longer each year if you a combination of a heater and cover, or an enclosure. Combine all three and you can swim year round except in severe weather. Plan carefully, consider your unique needs and budget, and you can maximize your family’s enjoyment in your backyard resort.